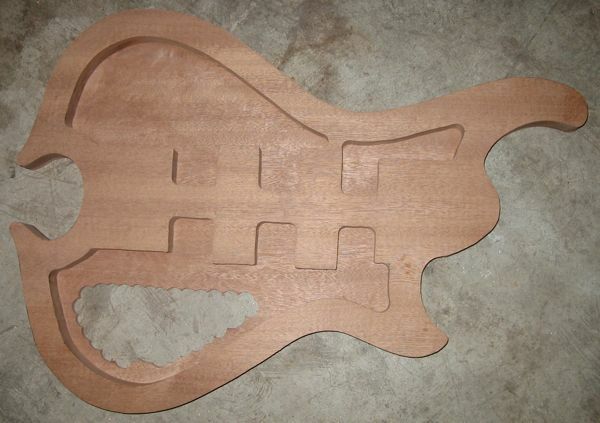 I cut out the template of MDF for the body, neck and headstock. 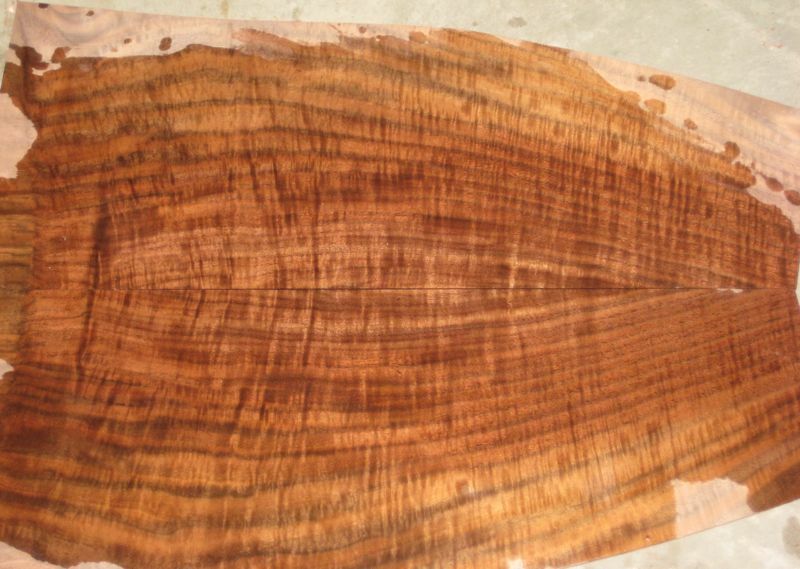 I was able to find a chunk of claro walnut that was 2.5″ thick for the top. 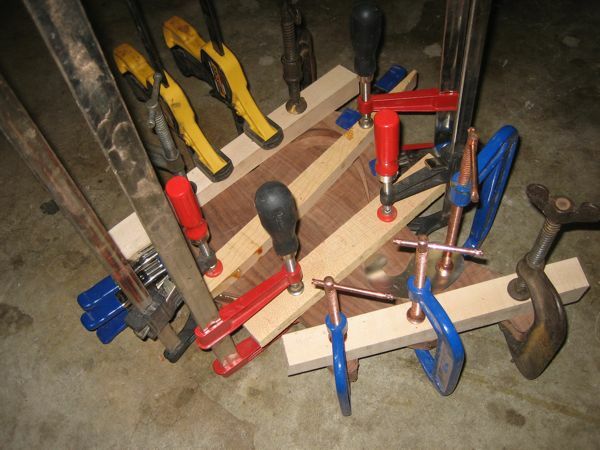 I had to resaw it on my bandsaw to make the bookmatched top that is 1/4″ thick. 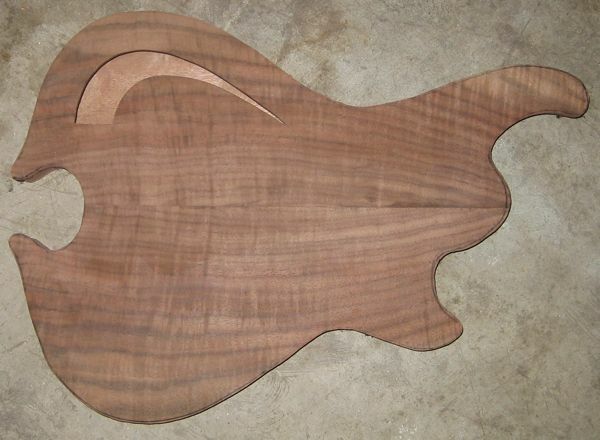 Here are a few quick pictures of the top with and without the template to give you an idea of what it will look like. I finally got to put in a full day of work. 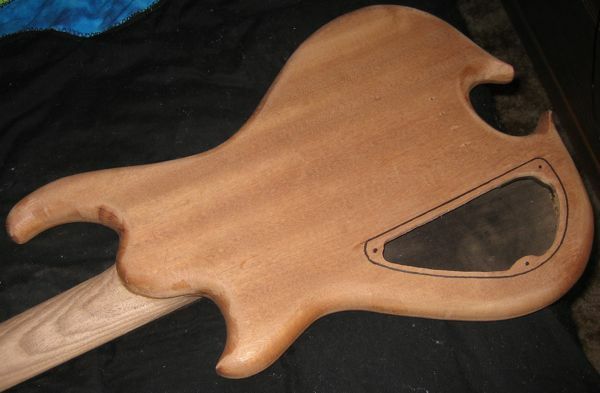 I glued the neck laminates together, cut the neck profile, shaped the headstock, drilled the tuner holes, made the truss rod route, made the volute and started shaping the neck. Oh and I also am letting the headstock cover dry as we speak. 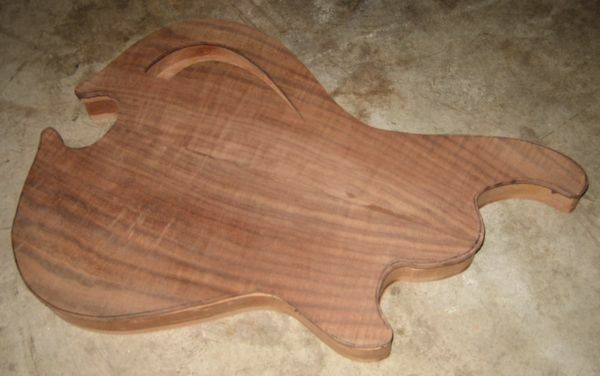 I glued the bookmatched claro walnut top together, rough cut out the shape and glued a black veneer to the back. 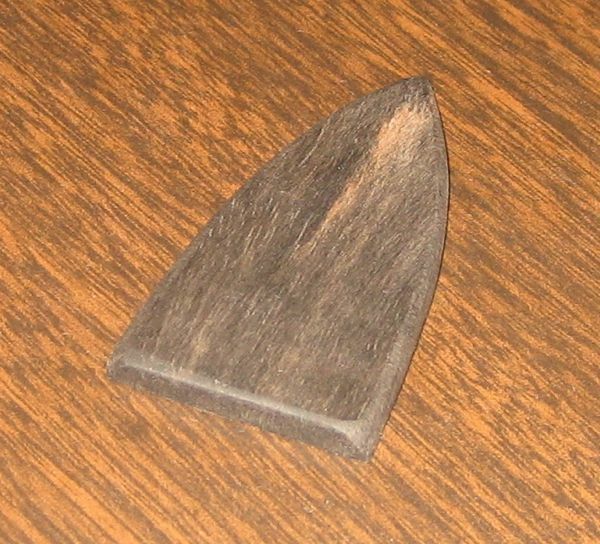 I took off about 1/16th of an inch in thickness of the snakewood fretboard, then tapered it to its proper size. I also put in the side dot markers. 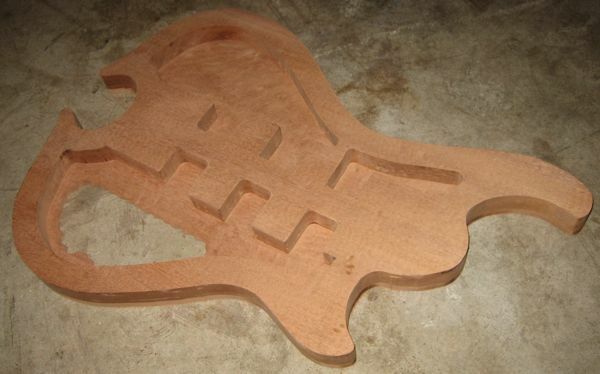 I then cut out the truss rod cover, have yet to inlay my “J” logo in it. I spent a couple hours working on the body this morning. 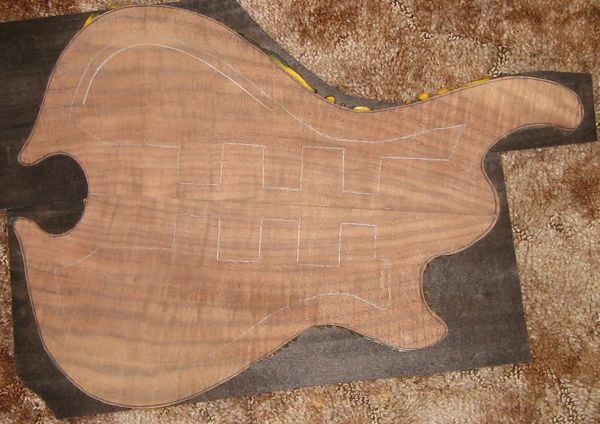 I finished almost all the routing except for the control cavity area. Here are a couple pictures of the body with the top sitting on it. All the wood and the bridge. Somewhere in there you can see the top being glued to the body. I went ahead and rounded all the edges over roughly. After taking quite a bit of wood out of this body it is surprisingly heavy, which will help it balance better. 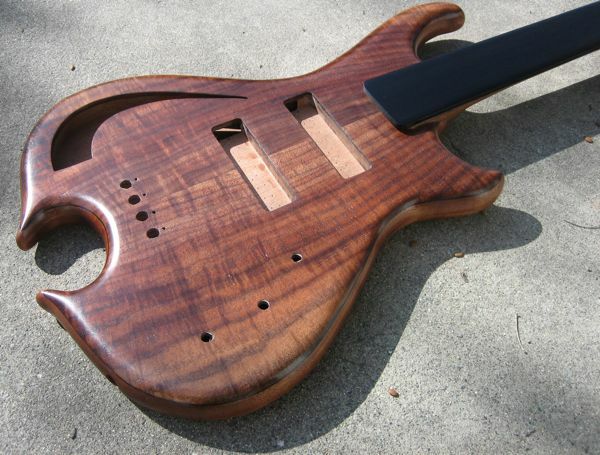 I ended up making the neck over, this time all out of walnut. It will look better from the back in my opinion. 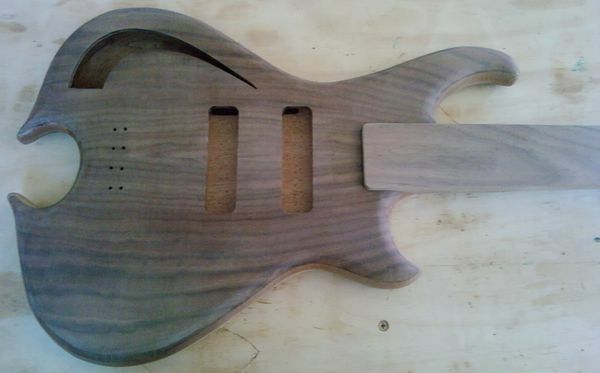 I also made the neck pocket and have started on the pickup routes. I can’t finish those until I finish the custom pickups I made and have the final sizes. 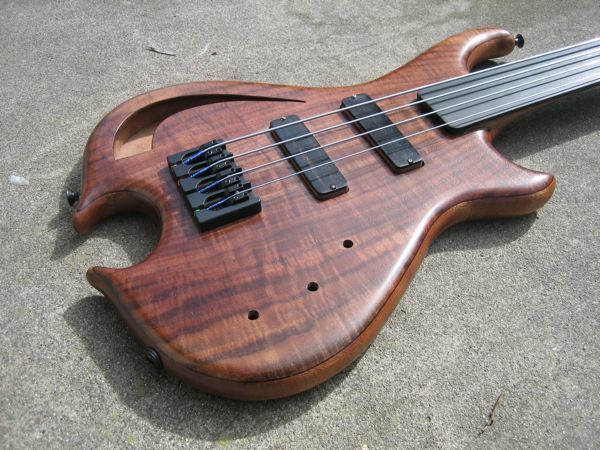 After taking time off to build the Mandobass, I am back to work on this one. 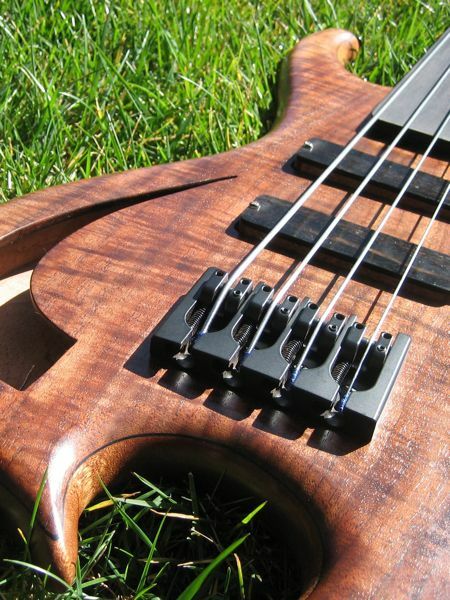 Sadly, the snakewood fretboard has been taken off to be used for something else. 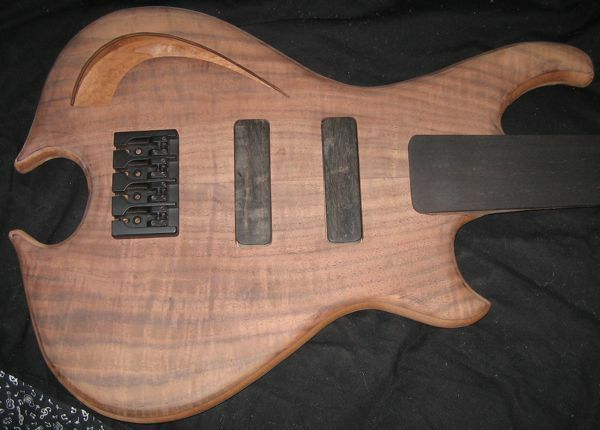 So I made a new neck out of black walnut and I will be using an ebony fretboard instead. I finished the pickup routes and neck pocket. 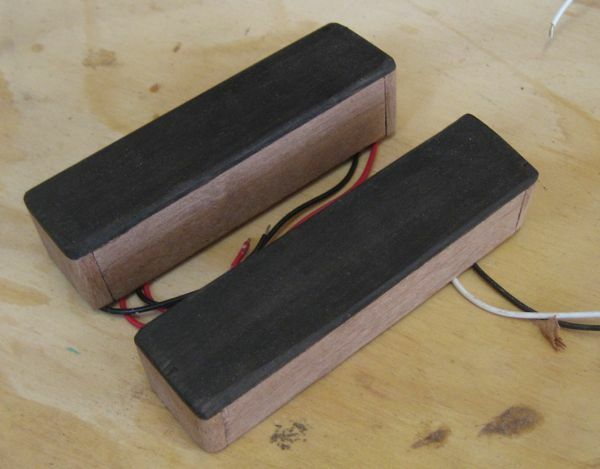 I plan on making some new pickup covers as well since I wasn’t happy with the first set. I got the new ebony fretboard glued on with the truss rod installed. I also started shaping the back of the neck. 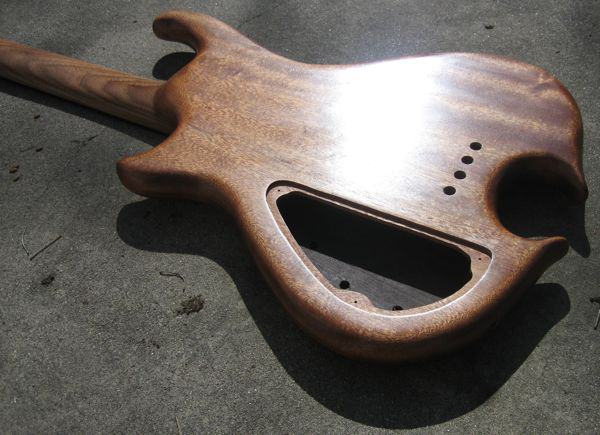 The bass is really coming along, I have mostly everything done. I made new pickup covers, glued some claro walnut on the headstock, made the side dot markers, drilled the jack hole, drilled the straplock holes and glued the neck in. 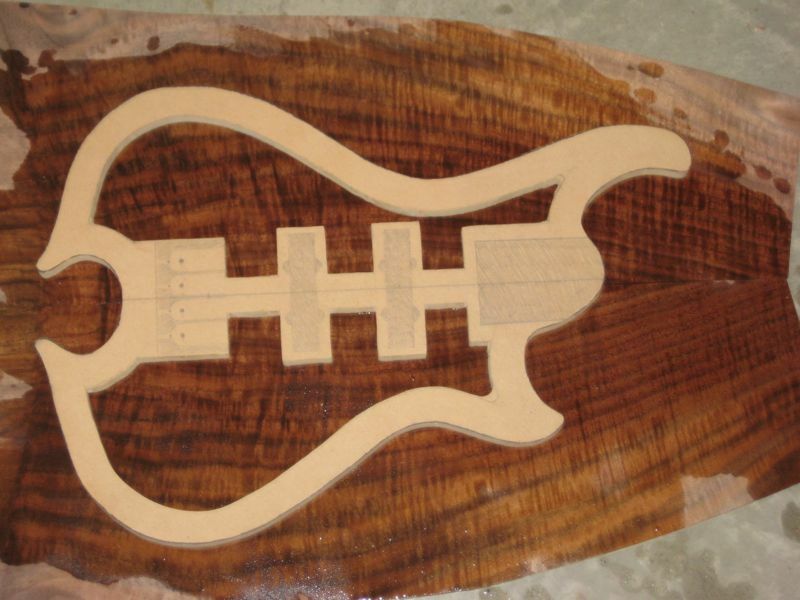 All I have left before the whole finish sanding process is to do the control cavity cover. Not much to update here besides a lot of sanding. 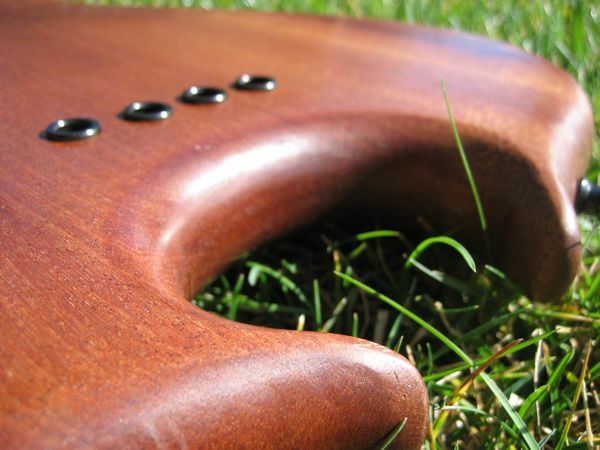 The fretboard is pretty glossy already, almost mirror like. 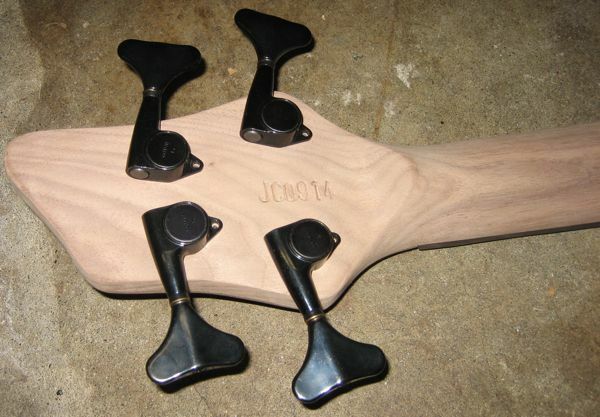 I did punch the serial number “JC0914” into the back of the headstock. 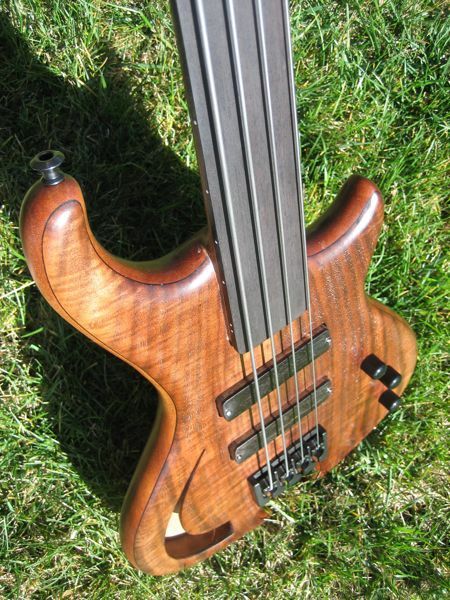 I also decided to go without a preamp for a more natural tone. 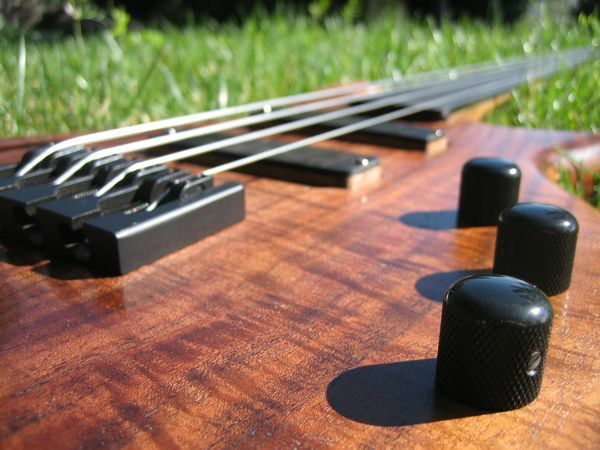 There will be a volume, tone and blend knob. 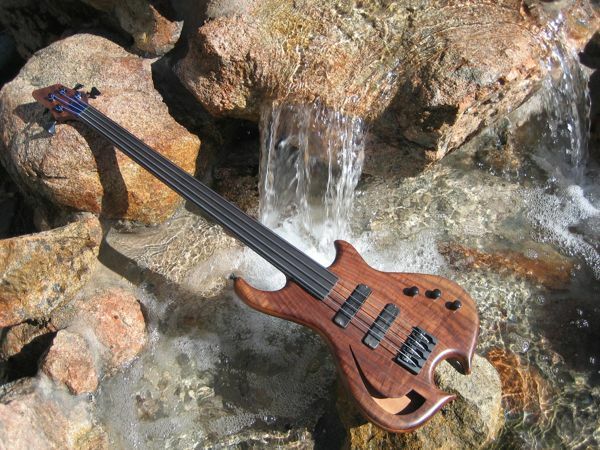 I am pretty sure I finished everything there is to do on this bass as far as woodworking goes. I made the control cavity cover and lip it goes in, drilled dozens of various screw holes and sanded for hours. 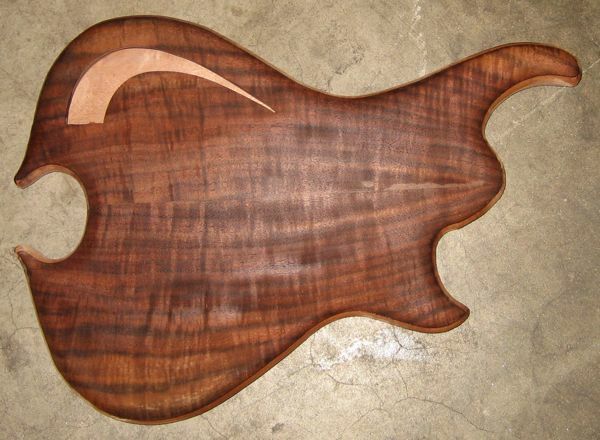 This is how the bass stands after 1 coat of tung oil. Almost done with the finish. I’ll put some wax on it soon and let it harden for awhile before I try to assemble it.